Khaira Arby, performing a Tiny Desk Concert for NPR Music in 2010. One of the most prized voices to come out of West Africa in recent years, the Malian singer and songwriter Khaira Arby, has died. Her death was announced by her American tour manager, Christopher Nolan, who said that she died Sunday in a Bamako hospital. She was 59 years old; the cause of her death was not disclosed. Her family told the AFP that she was being buried on Monday. Born near Timbuktu, Arby wasn't a singer by family trade — in a country where most musicians are born into griot families — though she was related, through marriage, to one of Africa's biggest stars: the late, Grammy-winning guitarist Ali Farka Touré. Her family resisted her vocation; Arby's father made sure she was married at age 16, specifically to bar her from pursuing music. She married and had children, but then divorced — later telling journalists that the reason that her marriage broke up is because she loved singing too much. One day, she stepped in for another female singer at a local concert, and her journey as a professional musician revved up again. Farka Touré proved an invaluable support to her resurgence, inviting her to appear with him as a guest artist and helping source the funds needed to buy equipment for her band. When outsiders (including this reporter) attended the famed Festival in the Desert in the sands of the Sahara in 2003 and heard Arby perform, her path to wider fame and international touring began. She had long been revered in Mali for her raw, rollicking vocals, as well as song textures that wove together the "desert blues" of Saharan artists and funky grooves from farther south. 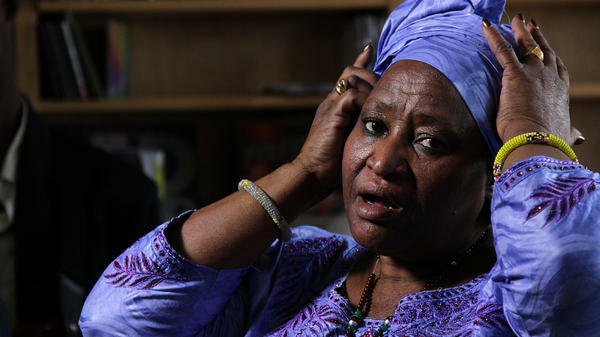 "In my music," she told the public radio program Afropop in 2010, "all the ethnic groups of Timbuktu find themselves, and I sing to all of them, one by one." Singing in an array of local languages — her first language, Sonrhai, as well as in Tamashek, Bambara and Arabic — she often used her songs as a platform for addressing social issues, whether decrying female genital mutilation, calling for women to be able to shape their own happiness and eventually becoming a strong voice for Malian unity and peace against the twin tides of Tuareg separatists and Islamic militants who took over the country's north in 2012, throwing Mali into utter chaos. Arby set out on her first North American tour in 2010 — and when she finally did reach these shores, made an instant impression. Arby became an early performer at NPR's Tiny Desk Concerts during her first tour and, the following year, was included in NPR Music's lineup at SXSW. As northern Mali descended into terror in 2012, Arby fled her beloved Timbuktu for the relative safety of Mali's capital city, Bamako, further south, after jihadists threatened her and her family and destroyed her instruments. But she continued to speak out: In 2013, she appeared with a veritable supergroup of Malian musical royalty — coming from all corners of the country and representing many of Mali's ethnic communities — to stand up against the implementation of sharia law by jihadist groups and the waves of terror and violence that forced hundreds of thousands of people either further south or into neighboring countries. Arby was eventually able to return to her beloved Timbuktu; just last December, she appeared as the first artist in a new concert series put on by a group called Timbuktu Renaissance. Despite fears of being kidnapped or harmed, she told The Guardian that she planned to move back to the city if a new recording studio could be built there. "Our religion has never banned music," the singer told the French newspaper Libération in 2016. "The Prophet was greeted with songs when he arrived in Mecca. Cutting music off from us, it's like keeping us from breathing. But we continue fighting, and it's going to go on, God willing."